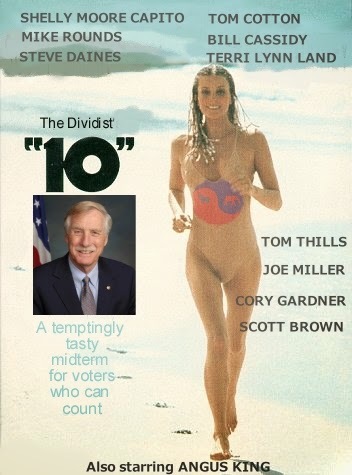 With apologies to "10" and Angus King. Sen. Angus King (I-Maine), who caucuses with the Democrats, will decide after the midterm elections whether to switch sides and join the Republicans. He is leaving open the possibility of aligning himself with the GOP if control of the upper chamber changes hands. “I’ll make my decision at the time based on what I think is best for Maine,” King told The Hill Wednesday after voting with Republicans to block the Paycheck Fairness Act, a measure at the center for the 2014 Democratic campaign agenda. King’s remarks are a clear indication that congressional leaders on both sides of the aisle will have to woo the 70-year-old senator in order to recruit him to their side. That lobbying battle could be especially intense if King’s decision determines which party will control the chamber in the next Congress If Republicans pick up six seats this fall, they will be running the Senate in 2015. But a pickup of five would produce a 50-50 split and Democratic control, with Vice President Biden breaking the tie. King could tip the balance..."
"The Dividist will once again predict a 50-50 split out of the election, just because it would be so cool. Plus it doesn't get any more divided than 50-50, and that makes the Dividist happy. The GOP will then secure the majority by playing the Prisoner's Dilemma Game with Angus King and Joe Manchin. Angus is an Independent and can caucus with with either party without paying a partisan penalty. Manchin already sounds more Republican than many Senate Republicans. First one to flip gets the choice committee assignments and chair of their choice. The second one to flip gets bupkis." It's not a difficult prediction. Despite Nate Silver giving the GOP narrow odds on taking the Senate outright with a net six seat pickup, the odds get much better if they only need five and can flip King or Manchin or both. Given the propensity for the GOP to underperform in Senate races even when they have a significant structural advantage (As they had in '10 and '12 / As they have in '14), it certainly conceivable that Republicans will fall short of an outright majority again. This puts Angus King in the catbird seat. And why not? Today King caucuses with the Democrats but ran and won his seat as an Independent. He owes no loyalty to the Democratic party. What is the benefit of being an Independent if you don't keep you options open? Caucusing with the majority in the Senate is to his advantage politically. More importantly, caucusing with the majority in the Senate is to his constituents advantage as he will have more influence with choice committee and leadership assignments. You can make the case that Angus King is not fulfilling his responsibility to the state of Maine and not being true to his Independent status if he did not maximize his influence by caucusing with the majority in the Senate. "Usually, you're better off losing rather than winning the governorship," Robert Erikson, a political scientist at Columbia University and one of the authors, told TPM. To demonstrate: President Barack Obama won each of these states in the 2012 election after the GOP triumphed in the 2010 gubernatorial races. Why is that? The professors didn't say definitively, but they took several educated guesses in their analysis. The most obvious one was the same widely accepted feature of the American political psyche that suggests Republicans have an advantage in the upcoming 2014 midterms simply because Obama is a Democrat: U.S. voters want ideological balance. This is, of course, the kind of political phenomenon that's impossible for the parties to act upon. Nobody is going to intentionally lose a governor's race with the hope it will pay off in a presidential election, especially when many important policy decisions are being made at the state level." The Dividist submits for your consideration that if this thesis is true for the governorship, it is even more true for Congress. If we go into the 2016 election with the Republicans in firm majority control of both the Senate and House of Representatives, electing a Democratic President will be the logical choice for Americans who prefer to see partisan balance in our federal government. 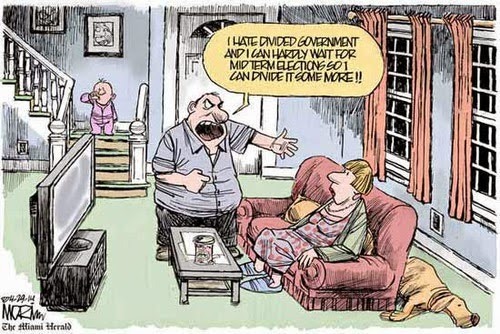 Americans like the Dividist. Since there is no possibility of the Republicans taking United One Party Rule of the federal government in the 2014 midterms, but that (narrow) possibility exists for Democrats, we will be voting straight GOP in 2014. 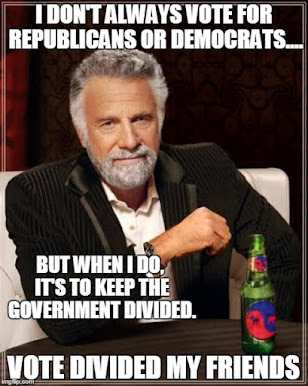 But the Dividist may very well need to change teams again in 2016.